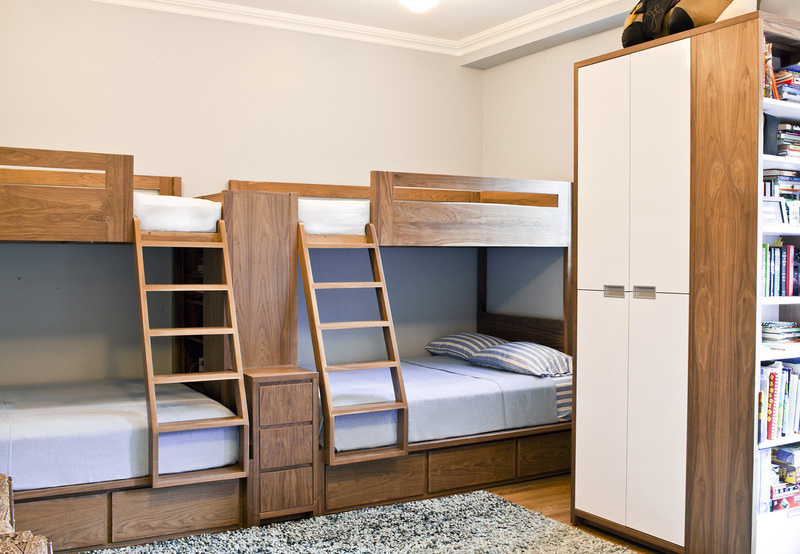 Brooklyn-based furniture company Urbangreen selected walnut wood coated in a clear, low-VOC finish for these custom bunk beds. "It brings out the natural beauty and detail of of the grain," says Elias Didaskalou of Urbangreen. "The materials used not only had to look good, but also had to ensure durability and longevity. Sustainability for Urbangreen, along with lowering our carbon footprint, also means handcrafting pieces that last a lifetime: Non-disposable furniture that will not end up in a landfill." For this Lake Tahoe family retreat the architects designed walnut beds with built-in storage and fabric headboards, each covered in hand-knit blankets by Marcela Rodriguez-Chile. The giraffe sconces are from Jonathan Adler. The family's girls play on a hand-embroidered Olli lounger from Heath Ceramics. Hidden within this renovation of a 1970s alpine residence are these unique beds: "Rather than trying to fit the furniture into the apartment," says the architect Antoine Santiard, "we decided to fit the apartment into the furniture. However absurd this may seem, it immediately alleviated all the constraints linked to laying out tight spaces." The wool curtain dividing the space was made by a local company called Arpin. The custom track is by G-Rail.